It was some time ago when I popped into Al Shaheen Restaurant in Karakum with Chris for a late dinner as I hadn’t had time to cook that evening. The restaurant is run by partners Imtiaz Ahmed and Muhammad Ashraf. Although I have known Ashraf for around 8 years and Imtiaz for nearly as long, I really didn’t know a lot about them personally and so asked them for a little bit of information about themselves. Ashraf came from Pakistan to North Cyprus in 1995 and worked at Rafters Restaurant in Ozankőy for some 7 years followed by 1 year at Efendi Restaurant in Girne. Imtiaz, also from Pakistan, moved to North Cyprus in 2004 and after a short time working with Ashraf at Efendi they decided to go into partnership and start a restaurant of their own. They started with a small restaurant in the centre of Ozankőy and named it Al Shaheen where they stayed for approximately one year and when the Mirabelle on the main road in Karakum became available they moved to this location in March 2006 and retained the name Al Shaheen. It is a really nice comfortable restaurant with a large dining area inside with an open fireplace for log fires in the winter and there is an equally large terrace at the front of the restaurant for summer dining. 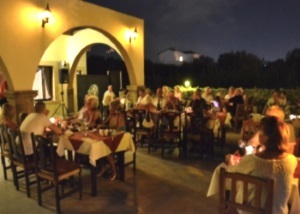 They have entertainment during the summer months which is always popular for people wanting a nice night out with good food and some music to listen or dance to. There is an extensive a la carte menu which should just about cover everyone’s taste, at very reasonable prices. On the occasion of our visit, it was fairly quiet and I took the opportunity to speak with Imtiaz and Ashraf to see if they would be interested in letting Chris and I do some fund raising for Help Those With Cancer Association – Tulips, at a suitable future event. We were delighted to hear that they had a Country Music Spectacular event coming up featuring Devon (aka Mr Rodeo), and they said they would be more than happy to let us mingle among the diners to try and raise some funds for this charity during the evening. 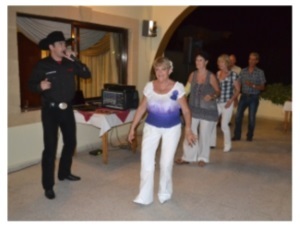 The event was a huge success and we were treated to line dancing from some members of the Phoenix Line Dancers who were present that evening. 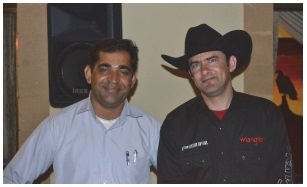 Devon has performed many times since then and has become a good friend of Imtiaz and his staff. Ashraf returned to Pakistan a while ago, but I am told he will be returning to the TRNC in 2015. Al Shaheen have a good reputation for their traditional Sunday lunch which they serve the whole year through and is very popular especially with the expatriates. 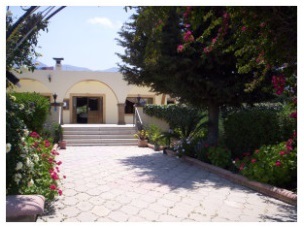 This entry was posted in Media reports and tagged Al Shaheen Restaurant Karakum, Cyprus Observer, Entertainment, Indian and European Food, Karakum, North Cyprus, TRNC by kyreniacatkin. Bookmark the permalink.